WTOPTV dot NET: See You Today! We'll be gathering in the little village of Thurmont today for our yearly afternoon of swapping old war stories, eating GREAT food and enjoying the companionship of old friends we'll never forget. It's a little earlier than usual this year, so the leaves won't be as pretty, but who cares. Buddy Belote and a few of us racked our brains trying to think of some minor entertainment for this year's event and came to the conclusion that just getting together is all the entertainment that our group is looking for. But we thought it would be nice if we opened the microphone to everybody this year and invite anyone who will....to stand and tell about a one minute story about the funniest thing, or the strangest thing, that happened to you during your years at WTOP. Actually, you can talk about anything you want to .... for about a minute or so. I was happy to learn that Don Richards will be there this year. We missed him last year but he had a good excuse: he was recovering from a broken hip. Speaking of Richards, these old newpaper ads should bring back memories. The weather forecast doesn't look great, but that only affects the outside. 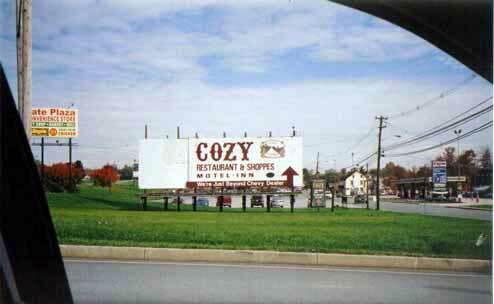 The forecast for INSIDE the Cozy Inn is.............BRIGHT and Sunny! We just got a note from Peter O'Reilly and it looks like he's going to miss our event this year. Peter has probably attended as many of the Thurmont lunches as anyone, but it just isn't in the cards this year. He's living down in Florida as most of you know, and the stars just weren't lined up right for him to make it this year. I spoke to Jim Silman a couple of weeks ago, and he's not going to be able to join us in Thurmont this year. He and Nadine will be in Lebanon visiting family. By the way, Jim spoke at Chuck Langdon's Metropolitan Old Time Radio Club meeting earlier this month, and was a big hit. The club members LOVE listening to old WTOP pros like Jim and Buddy! Bob Raiford's not going to be able to attend either. His syndicated radio show is keeping him busy. He sends his best, though. Gregg Oliver called me the other night. He's living in Atlanta, retired, and playing a lot of golf. His voice still sounds as good as it always did. He sends his best to everyone, but will be unable to attend in person. Remember Don Herbert? I'm not talking about Mr. Wizard, but the Don Herbert who joined the WTOP news department around 1964. I remember Don as a very bright young guy with a terrific sense of humor! His abrupt departure from the station was apparently the result of someone in management's bad idea made worse by poor judgement and a little bit of meaness mixed in. (Well, nobody's perfect!) Seems that someone got the big idea to fire one full time newsman, and use his salary to hire TWO kids right out of J. school. Don, being the lowest on the newsroom's totem pole, was chosen. To make a long story short, a memo was found that spelled out the plan and it was promptly given to Evelyn Fryman......and Don got his job back, but was not given any assignments, so shortly afterwards, he quit. In April of '65 he was hired as a writer at NBC news and soon became chief writer and producer with Robert Abernathy. Later he doubled his salary by taking a job with Chuck Barris and wrote for The Dating Game and The Newlywed Game. He finally got back on the air with KFWB in Los Angeles.....and stayed there for 30 years. He's retired now, and his second book is about to be published. It's called "We'll Have More Music, Right After The News"
"We'll Have More Music, Right After The News." Legend has it that was the last thing the last disc jockey said on the day KFWB changed formats, but thats not exactly true. I started that legend, many years back and it stuck. The real transition was boring as dishwater. It will be available soon thru Amazon and several major book chains. In fact, people will be able to order it at about 20 thousand book stores that have internet links around the country. Now, I am composing the flack sheet to introduce the book to newspapers,magazines and radio and TV. So, I would say, another month and it will be for sale. I dont know how much yet. The publisher sets the price based on the number of pages in the book. My book will have about 448 pages. Yikes!. I think those were also the same words Bob Raiford uttered before being fired that Christmas day for playing music on his show, shortly after WTOP radio went "all talk." REMINDER: Be thinking of your "one minute story" for our luncheon entertainment, and be sure to get your check in to Doris.